Hovercraft as we know them today started life as an experimental design to reduce the drag that was placed on boats and ships as they ploughed through the water. The first recorded design for an air cushion vehicle was put forward by Swedish designer and philosopher, Emmanual Swedenborg in 1716. The craft resembled an upturned dinghy with a cockpit in the centre. Apertures on either side of this allowed the operator to raise or lower a pair of oar-like air scoops, which on the downward strokes would force compressed air beneath the hull, thus raising it above the surface. The project was short-lived and it was never built, for Swedenborg soon realised that to operate such a machine required a source of power far greater that that which could be supplied by a single human occupant. In the mid 1870s, Sir John Thornycroft built a number of model craft to check the 'air cushion' effects, and even filed patents involving air-lubricated hulls. From this time both American and European engineers continued work on the problems of designing a practical craft. But not until the early 20th century was a hovercraft practically possible, because only the internal combustion engine had the very high power to weight ratio suitable for hover flight. In the mid 1950s brilliant British radio engineer Christopher Cockerell (later Sir Christopher), and French engineer Jean Bertin, worked along similar lines of research, although they used different approaches to the problem of maintaining the air cushion. Cockerell, while running a small boatyard on the Norfolk Broads in the early 1950's, began by exploring the use of air lubrication to reduce hydrodynamic drag, employing first a punt, then a 20 knot ex-Naval launch as a test craft. The limitation of this approach quickly became apparent, and before long he was fired with a far more ambitious idea, one in which a thin layer of lubricating air gave way to a deep air cushion which would raise the craft above the surface, enabling it not only to clear small waves, but also to make the transition from water to land and back again. 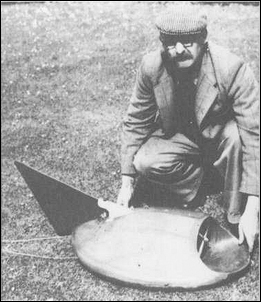 To check his own theory, Cockerell used little more than a couple of tins, a blower and a pair of scales. By inserting a cat food tin into a coffee tin, and blowing a jet of air through the gap between the walls of the inner and outer tins, he demonstrated the possibility of a machine that could one day travel on a cushion of air. Aimed at the scales, the blower's jet pressure alone was 1lb (0.45kg). The jet coming out of the tin assembly when brought near the scales gave 3lb (1.36kg). 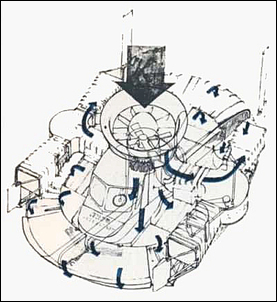 Unlike earlier plenum-type air cushion vehicles, in which air was simply forced by a fan into a larger chamber beneath the vehicle and allowed to escape, Cockerell's concept was that air would be taken in through a large fan and separated, a percentage being directed to the cushion via a system of slots around the underside perimeter of the craft, with the nozzle aimed downwards and inwards to form a continuous air curtain. 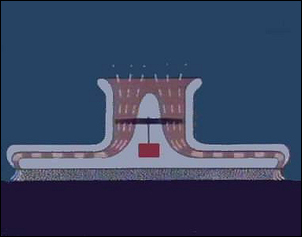 This would create a jet of high pressure air that would move under the hull and be retained to a certain extent by the jet line that formed the curtain effect, the balance of the air being ejected through ports at the rear of the craft for propulsion. It was this idea - an airflow system - that was the key to progress. 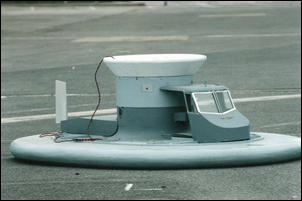 Christopher Cockerell had a neighbouring boat builder produce a working model hovercraft. His idea worked very well in model form, but as was later found, considerable power was required to maintain the cushion, and also the hard structure clearance was not ideal. It was then the duty of anyone who thought an invention had any military value to contact the Service ministries and give them first refusal. Accordingly, the model hovercraft flew over many Whitehall carpets in front of various government experts. It was then promptly taken out of its inventor's hands and put on the secret list where it languished for over a year, no one having any idea what to do with it. News gradually filtered in from abroad of similar projects, particularly that of a Swiss engineer, and Britain seemed to be in danger of losing the lead it held. A member of the Ministry of Supply staff, Mr R A Shaw, then took a step which was to have important consequences. He authorised a small contract to the aircraft company Saunders Roe, to check the design of the vehicle. The Saunders Roe report was favourable and Cockerell gained permission to approach the National Research and Development Corporation (NRDC) to see if they might be prepared to give the hovercraft backing if the project could be freed from the secret list. This Corporation was financed by loans from the British Board of Trade to develop and exploit (where the public interest is involved) British inventions to the manufacturing stage. Cockerell took a film of the model performing various manoeuvres to show the NRDC in April. The next morning they made their offer - they were prepared to put up £1,000 immediately for securing Cockerell's patent rights. 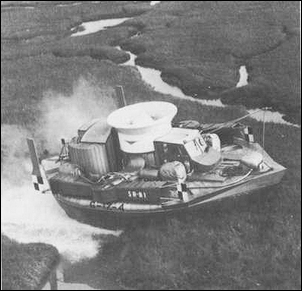 In a later article, Cockerell recounted, "hovercraft very, very, very nearly didn't happen" - at the crucial NRDC board meeting it was only the Chairman's casting vote that secured NRDC backing for the hovercraft project. 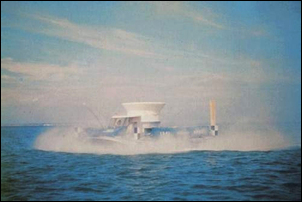 With the eventual object of forming a British Hovercraft industry, NRDC ordered an experimental craft, the SR.N1, from Saunders Roe (Aviation) in the autumn, after having eventually got the craft off the secret list. Hovercraft development for civilian use could now go ahead, as its value for military purposes had not yet been proven. 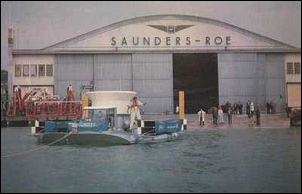 Saunders Roe threw themselves into the project with great enthusiasm, with the result that the craft was completed two months ahead of schedule, only eight months after starting work. The Cockerell-designed research vessel Saunders Roe Nautical One (SR.N1) appeared in May at East Cowes, Isle of Wight - the first flight taking place on 11th June. The press were present in force and watched with astonishment as the model craft was demonstrated to them on a lawn and over a small 'obstacle course'. It was then the turn of the full-sized craft to demonstrate its capabilities, and this was carried out on the concrete slipway. It was obvious that this was not going to be enough though, so the craft was then towed out in to the East Cowes yacht basin by a launch - a nervous time for its engineers as the craft had not taken to water before! All went well though and that craft performed flawlessly, having photographs taken against the Queen Mary which was passing at the time. A few weeks later it performed in a Combined Operations exercise and won commendations from the very services that had spurned it only a year before. This first skirtless craft could operate only in calm seas up to 1½ feet (46cm) in height and negotiate obstacles of 6 to 9 inches (15 – 23cm). 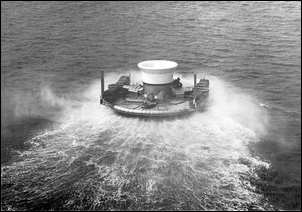 Having been shipped to France by tender, the world's first all metal hovercraft crossed the English Channel between Calais and Dover in 2 hours, 3 minutes on the 25th July with Captain Peter Lamb piloting, Mr John Chaplin as navigator and the inventor, Mr. (later Sir) Christopher Cockerell in his own words as 'moveable ballast' on board. The following morning at 3.00am there was a flat calm and after a brief look at the sea outside the harbour the Chief Test Pilot decided to make an attempt with as little delay as possible. With Mr C S Cockerell and Mr J Chaplin aboard, the craft cleared the harbour entrance at 4.55am just ahead of the RAF Rescue Launch. The wind, such as it was, outside the harbour was about 5kt from the north east. With the craft above hump speed the pilot decided to make as much northing as possible, for the true track was 294 degrees and any increase of wind, which was to be expected with sunrise, could then be used as a quarter to tail wind in the latter stages. When the craft was well clear of the Whistle Buoy, marking the approach entrance to Calais, the pilot decreased rpm to 2,700 with the craft still above hump speed (estimated 18-20kt). At this time the loom of the South Foreland light was just visible, but fast disappearing with the approach of daylight. For the next five miles, navigation was made by dead reckoning, with the RAF Rescue Launch, which had previously agreed to maintain a true track from Calais to Dover, well away on the port side. At approximately 5.30am the white cliffs of Dover, tinged with red in the morning sunrise, were first visible. Up to this time the SR.N1 appeared to have made extremely good progress at a constant setting on 2,700 rpm. However a slight swell was now apparent which retarded the progress of the craft and on several occasions dropped her back below hump speed. When this happened the pilot was forced to accelerate by increasing rpm and altering to a westerly heading to ride above the hump, before resuming the true course with minimum engine power. In mid-Channel the wind appeared to increase. This was especially noticeable by the drift of the craft when well above the hump. This factor coupled with the larger swell, which appeared to be travelling in the same direction as the wind, produced at times the disconcerting fact of nosing-in with the port propulsion duct. It was at this point that a small boat, over which the SR.N1 had the right of way, appeared on a constant bearing. When it was obvious that a collision would be imminent if both craft pursued their present courses, the pilot was forced to alter heading in to wind to starboard. At the same time the small boat, which either had not been keeping a good look-out or had been completely misled by the drift of the SR.N1, altered course to port. With muttered oaths to mariners, the pilot was forced to put the SR.N1 statically on the water and allow this small boat to manoeuvre out of the awkward in which it found itself. After this incident the SR.N1 took an appreciable time to get above the hump speed: in all probability due to the variable wind and moderate swell. Both Mr Chaplin and Mr Cockerell tried moving their positions with little success. After proceeding for two miles below hump speed, the craft crossed the swell of a large ship proceeding north through the Straits of Dover. An appreciable amount of water was shipped on the port side from this swell and both observers moved to starboard to compensate the trim of the craft and avoid getting washed overboard. After refuelling, the craft was clear of the swell in the lee of St Margaret's Bay, and it proceeded at the best speed it had obtained throughout the whole passage up and through the entrance to Dover Harbour. It was estimated that the craft probably achieved 30kt in the last mad dash. 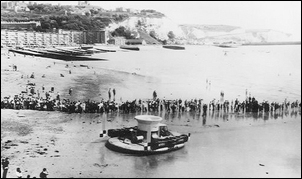 The craft proceeded through the harbour and beached adjacent to the Clock Tower some 2 hours and 3 minutes after getting underway at Calais. 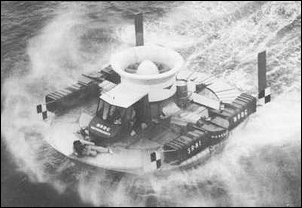 Although the SR.N1 was the first hovercraft to cross the English Channel successfully, it was plagued with slow performance and the inability to traverse even very small waves easily, with a hoverheight of only 9 inches (23cm). At first it had seemed as if the peripheral jet would provide sufficient clearance height to allow a medium size craft to negotiate coastal waters, at least, without employing more than one half or one quarter of the power required by a conventional aircraft or helicopter of similar capacity. But in practice, the clearance height was only one twentieth or one thirtieth of its beam. This meant that craft 40ft (12 metres) wide and 80ft (24 metres) long would have a clearance between the base of their hardstructure and the surface beneath of only 1 to 2 ft (30 – 60cm). Had this situation continued, the air-cushion vehicle would not have advanced beyond the stage of an interesting aerodynamic phenomenon, but with very limited practical application. Further work by another inventor, C H Latimer-Needham, on the flexible skirt produced the breakthrough required to enable the craft to maintain a deep enough air cushion for the negotiation of waves and obstacles. After reading about Cockerell's experiments, he thought about the size of the waves that these craft would likely encounter in the English Channel and the Atlantic, and was convinced that this clearly called for some form of flexible skirt to contain the air cushion and enable vessels to traverse significantly rougher surfaces. On contact with the obstacle, the skirt would tend to collapse, but by reducing the peripheral diameter at the base, either by built-in taper or curvature, there would be a downward component of force tending to keep the skirt extended. In October 1961, Latimer-Needham sold his skirt patents to Westland, the parent company of Saunders Roe Ltd, which had built the SR.N1. These earliest Westland skirts were simply extensions of the inner and outer edges of the peripheral air ducts at the base of the hardstructure, made in two sheets of rubberised fabric and feeding air in to the cushion through the gap that separated the skirts at the hemline. Air from the lift fan simply entered between the two walls of the skirt, which then inflated, and was discharged in to the cushion at its base. As the skirt concept was developed, easily replaceable 'fingers' or loops of material were fastened at the hemline to reduce water drag and take the wear. The introduction of the skirt was a vital engineering breakthrough. It meant that the total depth of the air cushion beneath the solid structure was now equal to the depth of the skirt, plus the daylight clearance or hovergap between the skirt hemline and the ground. Engineers at Westland soon ascertained that, for a given power, the obstacle clearance height was ten times greater. Apart from being subjected to very considerable wear and tear, particularly at high speed over water, it was felt the skirt would offer few operational problems. It would deflect on coming in to contact with waves, rocks and jetties, and since afterwards it would return promptly to its normal inflated shape, air leakage would be minimal. In 1962 the SR.N1 was fitted with a Rolls Royce Viper jet engine for forward propulsion, and now made 50 knots with ease. Previously it had a piston-engined maximum of 35 knots. With a 4-foot (1.2 metre) skirt fitted around the perimeter of the craft, the craft could cope with 6 to 7ft (~1.9 metres) waves, cross marshland with gullies up to 4 feet (1.2 metres) deep and traverse obstacles up to 3ft 6in (1 metre) high. 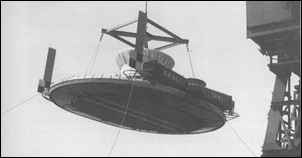 Moreover, the craft was now operating at twice its original weight, with no increase in lift power. With this new configuration, hovercraft developers around the world took note and high performance craft started to appear. 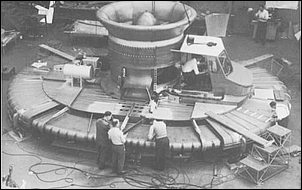 The craft was gradually modified over time, both in hull shape and by the addition of a propulsion air intake 'shed' as well as cushion air bleed control ducts. Being of such important historic interest, the SR.N1 is now in the care of the Science Museum in London.